If you’ve been following our blog, you probably read some of our localization resource files articles, in which we describe specific file type and explain how our platform can be used to localize it. After all, creating multilingual software for apps and web apps is now an absolute must to reach users in different countries and locales. We are glad to admit that Text United already supports the majority of file types, and that’s why we decided to sum up all the essential info and create a mini guide for beginners on localization resource files. Like this, beginners can get themselves acquainted with the characteristics of the most popular resource file types used in localization. Shall we start? How does localization based on resource files really work at Text United? It’s only fair to describe localization resource files’ formats when it’s clear what’s going on when you upload one to our platform. When you submit one of the files to Text United, our system filters out your textual content and makes it editable in a translation friendly UI. Then, professional translators translate it without touching any of your code – that’s why you don’t have to worry about your translation project being messy. 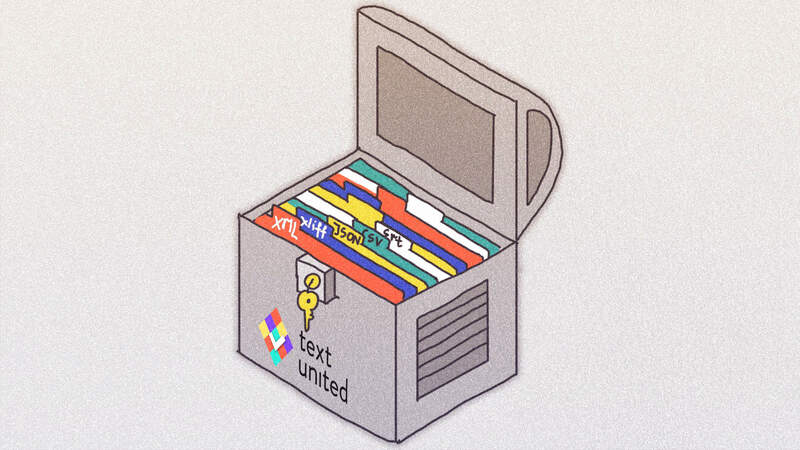 Your resource files can be imported to Text United in multiple ways. From a simple upload file-based project to integrating with your GitHub or BitBucket repository. Additionally, for advanced localization users, we also allow API integration. .idml (Adobe InDesign Markup Language): .idml files are a representation of an InDesign document or components. They provide an interchangeable format for Adobe InDesign documents and they also enable third-party tools to modify and assemble InDesign files. .html or Hypertext Markup Language specifies information about text on a website. A standard .html contains complex doctype and character set, audio and video can’t be part of it, it’s suitable only for static web pages and it needs plug-ins like Java, Flash, and Silverlight. Its younger sibling, .html5, contains only one doctype <!DOCTYPE HTML>, the audio and video can be embedded in it and it can include more attributes and interactive elements. Chances are that if you own a website that has been updated in the last few years and if it’s created with one of the popular CMS tools like Joomla or WordPress – it’s already based on .html5. Resx (Microsoft, .NET) is a monolingual file format used in Microsoft .Net Applications. It consists of XML entries that specify objects and strings inside XML tags. .strings (Apple iOS) consist of key-value pairs usually coming along with comments – although these are optional, they’re great for providing the translator with context. .xml – Extensible Markup Language (Android, Custom CMS export) is one of the most widely used file formats for representation and transferral of data structures. Its structure enables you to separate content from form and to categorize data in a way that can be easily processed by software. .po, .pot (portable object and portable object template) files are the absolute standard for multilingual websites in PHP. PO files contain the actual translation. Each language has to have its own PO file, for example, for Italian, there would be it.po file, and for Polish, there would be a pl.po. POT files are basically the template files for PO files. The French PO file (fr.po) is simply a copy of the POT file but with the translations inside. .xmb (Angular localization resource) is a basic, a key-value pair list with a mechanism for named placeholders, with descriptions and examples, but with no deeper structure. How to prepare for localization? To start building a multilingual app or web app you need to collect the content from your app into resource files. For Android apps, resource files are usually saved in the .xml file format and iOS apps use the .strings extension. These files have to be organized in the structure of your project. Then, you translate your resource files and create a new folder appropriately to the languages you translated your content to. Text from images and banners will need to be extracted in a separate file. Images will need to be redesigned again by your graphics designer and Video material should be transcribed and provided subtitles. No matter what kind of localization resource files you are using – with Text United your workflow will be straight-forward and simple. Create a project, assign translators and start working on the project immediately!